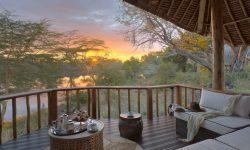 Tsavo is the oldest and largest national park, totalling 20,333sq km and ws originally designated as Kenyas first national Park in 1948. 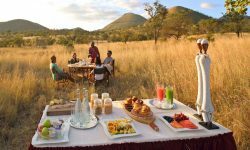 The Park Borders Tanzania’s Mkomazi National Park, Kenya’s Chyulu National Park, Arabuko Sokoke National Forest reserve on the Kenya coast and various estuaries, conservancies and group ranches. 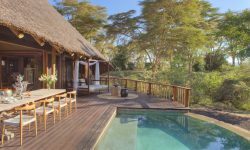 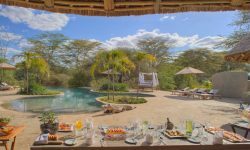 Located in Tsavo West National Park, Finch Hattons Eco Tented Camp is set around natural fresh water springs within 34 acres of pure untouched wilderness and surrounded by views of Mount Kilimanjaro and the magnificent Chyulu Hills. 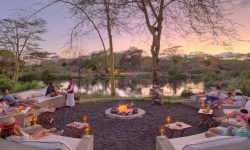 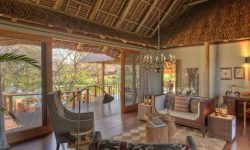 Originally in 1993 and reopened in 2015 after a complete rebuild, the camp was names the best new safari camp by Architectural Digest in 2015 and also voted in 2016 Africa’s Leading Tented Camp 2016 at thr world Travel Awards. 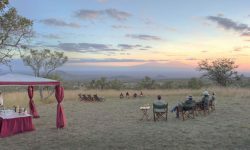 The camp consists of 14 Luxury spacious tented Suites with King and Twin configurations which are all en-suite, 2 bedroom Luxury Tented Suites with 2 en suite bedrooms ad lounge with extended viewing deck. 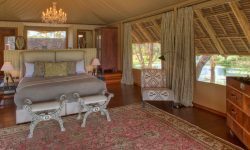 The exclusive luxury en suite bedroom of the Finch Hattons Suite comprises of a large outdoor deck, heated plunge pool, lounge and dining, a private butler service, a separate body guard room, private chef for in suite dining and exclusive use of safari vehicle. 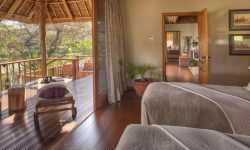 Each suites have overhead fan, free standing bath, indoor and out door shower, flush toilet, safe, , hairdryer, universal plug sockets, laundry facility. 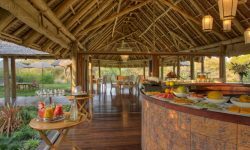 The Camp has multiple dining locations, bar and lounge, a star gazing terrace for those clear African nights, a 12m high observation deck, outdoor boma and fire place, Infinity pool for cooling of on hot days, Library and research centre, conference facilities, curio and a Spa. 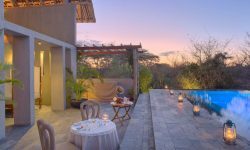 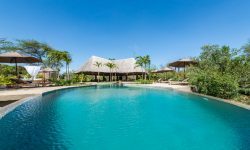 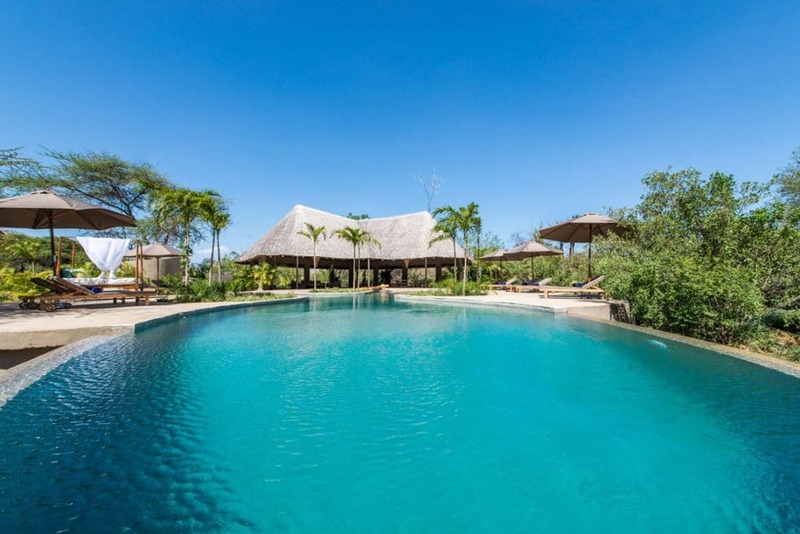 The Chyulu Spa and Wellness Centre offers 2 outdoor massage pavilions with AC, a spa pool, gym, hammam, yoga pavilion deck with the magnificent vies of the Chyulu Hills and a relaxation area with Lamu Beds. 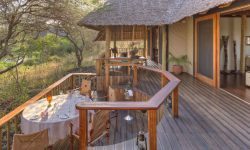 The camp also has Kids play area and bush and wildlife activities as the parents relax and soak in the environment. 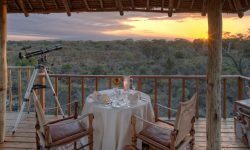 Although tailored to guests needs, there are a variety of exciting activities to do at Finch Hattons such as: Crater climbs, Yoga and Fitness training, Scenic air flights, Guided bush walks, Bush sundowners and breakfasts, Game drives around Tsavo , Mzima Springs, Chyulu Hills, Shetani Lava Flow, Lake Jipe, Rhino Sacntuary, Roaring Rocks, Poacher’s lookout and Cultural and community based visits to Iltilal Maasai Village.